The Loop de Loop is a traditional mini golf obstacle and no putt putt miniature golf rental should be without one. 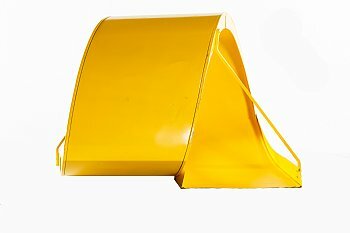 The Loop de Loop mini golf obstacle measures 24 inches long from the entry ramp to the exit ramp, 32 inches wide and 24 inches tall. Our putt putt miniature golf rental course designers love the versatility of this mini golf obstacle as it can be placed on a zig zag terrain, dog leg left or right or an extender. 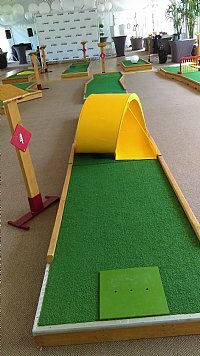 The Loop de Loop mini golf obstacle is included as a standard item on our 9 hole putt putt miniature golf rental course. There is a something special about that sound of a mini golf ball entering, twirling and exiting our Loop de Loop mini golf obstacle. 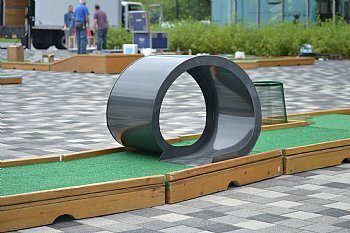 As with our Ant Hill, Steel Bridge and The Slide mini golf obstacles, the Loop de Loop mini golf obstacle is made to be either outside or inside on our putt miniature golf rental. 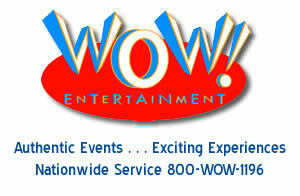 To learn more about this mini golf obstacle and the many other unique features of our putt putt miniature golf rentals please call one of our event specialists at 800 WOW-1196.